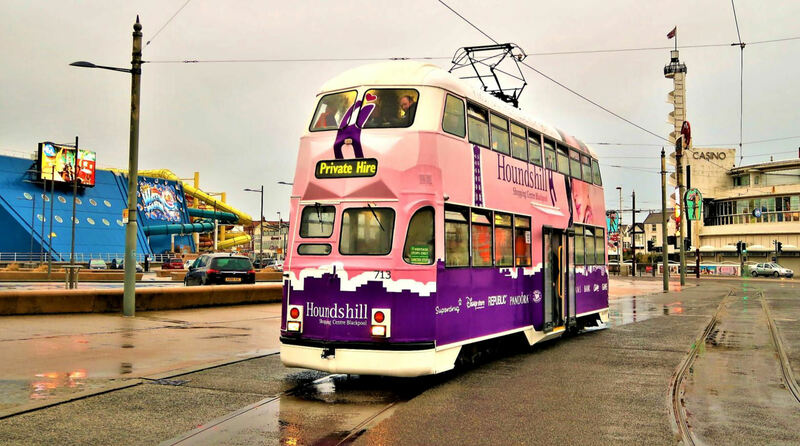 Blackpool in January - probably not the first choice for a day out, but 80 hardy souls thought otherwise and were rewarded with an interesting and eventful trip around the Blackpool Tram network. First of all, actually making it there was something of a challenge for those travelling by rail, due to the then continuing Northern Saturday industrial action (although there were trains running), but a late morning start gave enough time to travel from Blackpool North to Rigby Road Depot from the first arrival of the day, 09.32 (SO) from Birmingham New Street (390115) by various means, including Tram 147 from North Pier making a special extra stop at Manchester Square to set down tour passengers. 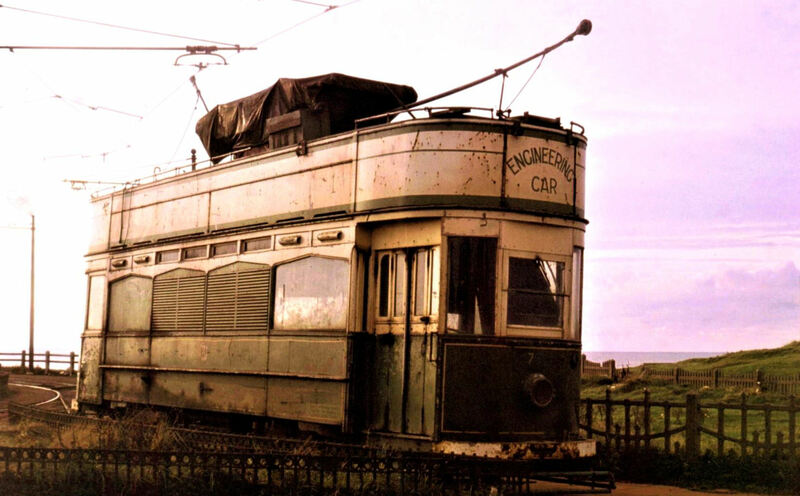 After the departure of Tram 711, in use as a shop for the Heritage operations at North Pier, and some shunting of Engineering Tram 754, to feature later, Tram 713 emerged from the depot to form our Tour. 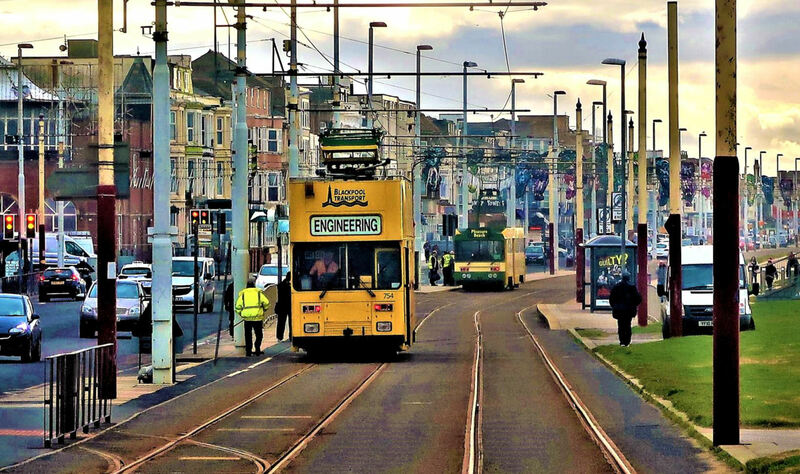 Departing from Hopton Road, it made its way first to Tower, reversing alongside the famous landmark, before heading to Starr Gate, the southern end of the line, and base of the Flexity trams that provide the normal service. A trip round the Depot Loop, with a short delay to manually open the gate - sand, salt and water don't mix well with the electronics in the transponder that should open the gate - led through the washer (a dry run) to the depot apron and shunts covering depot Roads 5 & 6; to the end of lines, naturally. After visiting the headshunt, our tram tour covered about half of Road 3. This allowed us to see all the Flexity trams not in service that day in the two sides of the building. After a shunt onto the main line, a second run around the Depot Loop was made, this time with the washing plant working, before heading back north along the promenade to North Pier, where works were underway for the future Blackpool North station branch. Another reversal here took us back south to Foxhall crossover. Here we met up with Tram 754 to cover one of the sections missed on our last tour on 19 Nov 2016, the crossover at Manchester Square - missed for the obvious reason it is not wired! However 754 can also operate on diesel power so it dragged us over the crossover before detaching and returning to Rigby Road; our tour followed it back via a reversal at Foxhall Crossover. 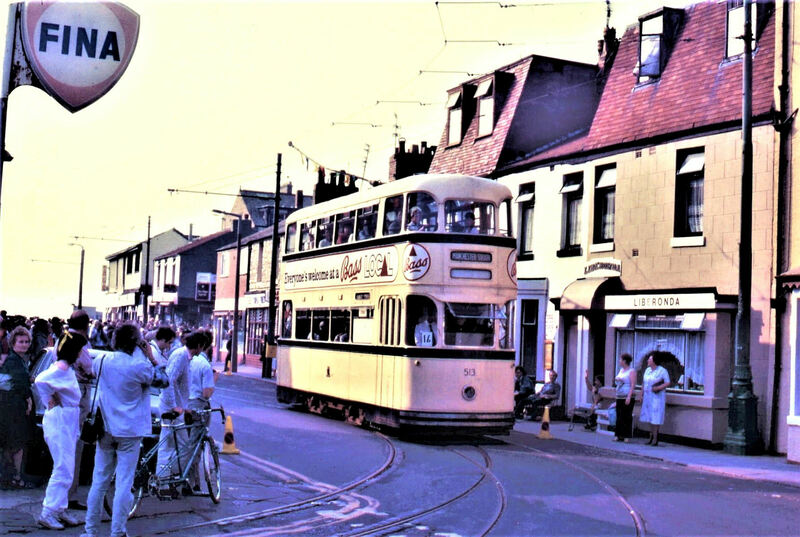 Although our tram had not broken down this was motive power on the non-wired section ahead and round 180O (to the left) from here to the paint shop at the rear of the building seen. 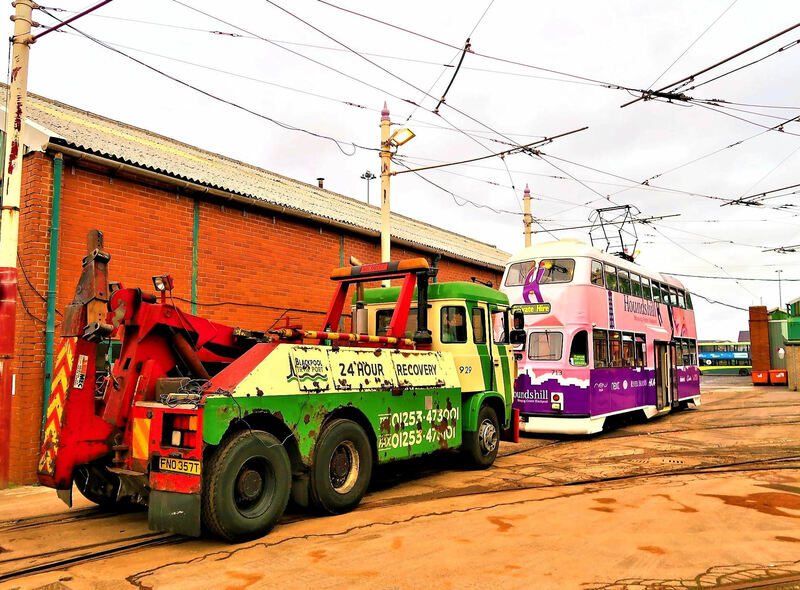 Blackpool No929 is an ERF 'B Series' recovery truck, able to attach a tram coupling bar. Thus equipped, it was used to push our tram around the direct curve into the depot and through 270 degrees left round to the Paint Shop doors, returning back to the tram sheds. This was another non-wired section most thought they would never do. The unusual combination of road and rail together was a first for many, even bringing out tram staff for a photo. A short break was taken to look at the heritage fleet and take a few photos before heading to North Pier by more conventional means and a lunch break. Suitably refreshed, and in deteriorating weather, participants settled back for the long ride to Fleetwood, via Bispham and Thornton Gate centre roads, and back to Fisherman's Walk to reverse again. Then it was back around the Fleetwood Loop, noting the North Euston Hotel on the left, this time using the outer line; a short photo stop was made in the rain alongside the Pharos Lighthouse. 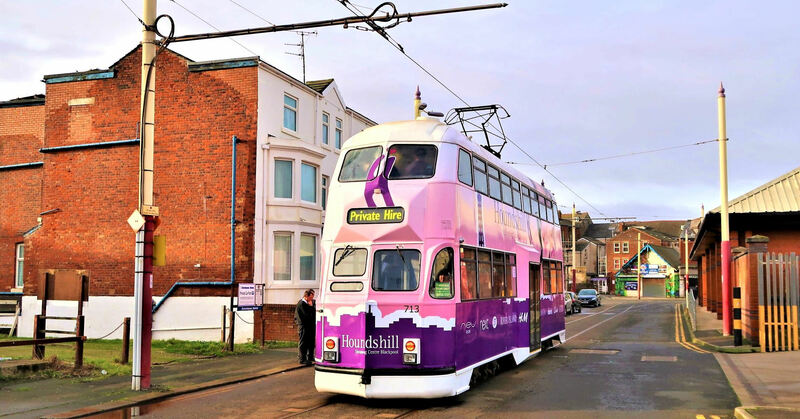 Another long run followed, to Pleasure Beach turning circle, covering two sections missed in 2016, the Bispham Centre Road north connection, and outer line at Pleasure Beach Loop. There was another short stop for a leg stretch and photos (still raining) before setting off again and into a problem. Coronation Tram No642, one of the six in 'Heritage' service that day, had come to a stand in front of us at Foxhall. 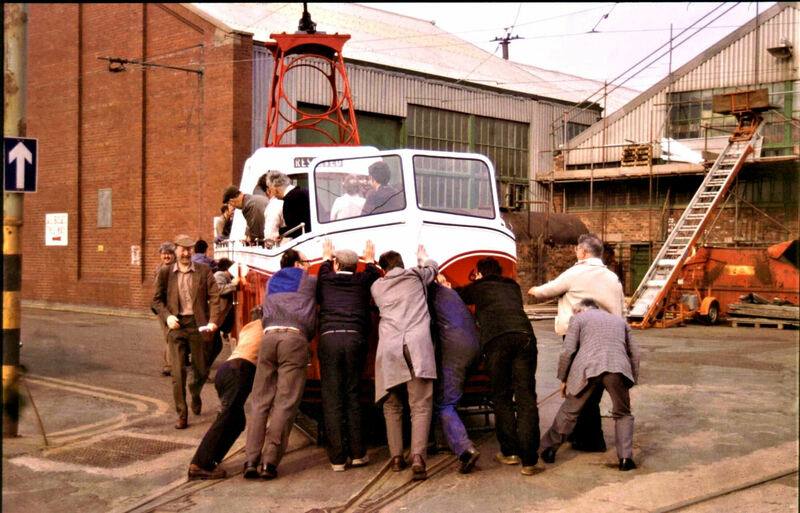 The Engineering Team were quickly on hand and our driver went forward to offer help. Despite their best efforts, including lowering and raising the pantograph to reset (turn it off and turn it on again...) '642' would only work in one direction, and, of course, not the direction it should be going! So, out with a coupling bar again for us to push '642' past the crossover, allowing it to return to Rigby Road. It nearly worked, but '642' stopped again on the crossover, now blocking both lines. 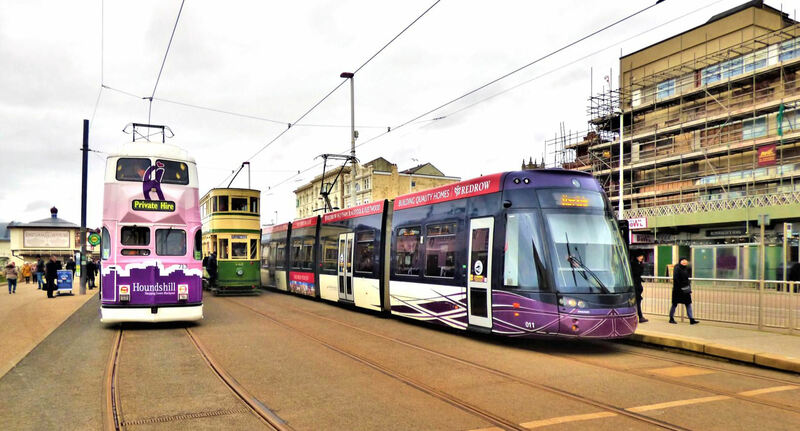 Eventually Tram 711 arrived from its retail duties earlier at North Pier and the pair were banished to the depot. 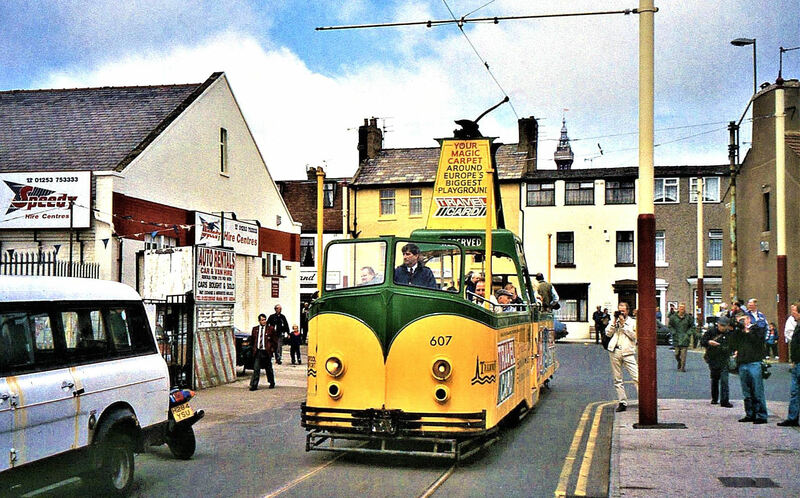 Our tour tram outside Blackpool Rigby Road Depot, the line in the distance curves right (and becomes double track) heading towards the promenade. 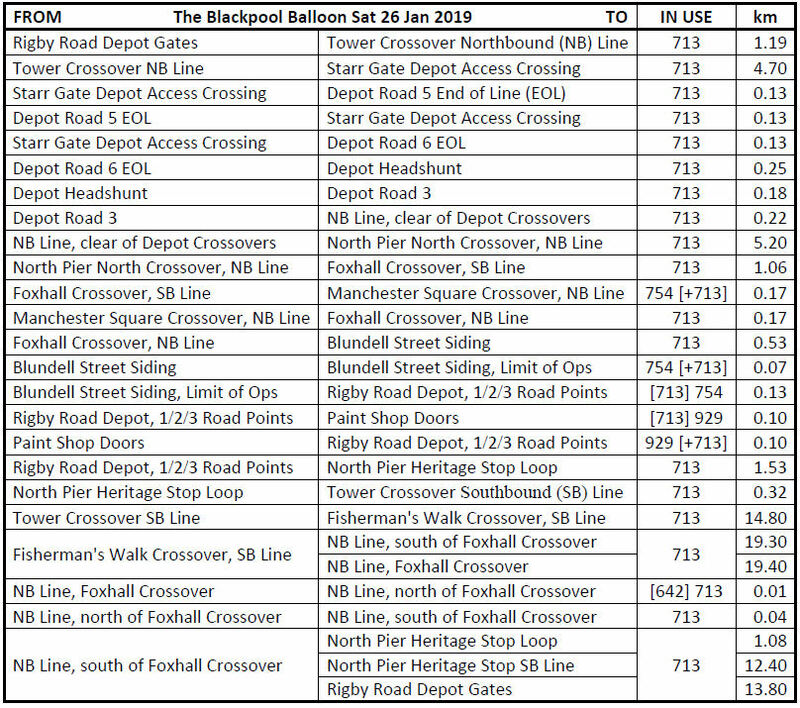 With the line reopened, the delays allowed a clear and fairly rapid run back to Little Bispham for the turning circle, [after all one good turn deserves another] and likewise back south, before finally arriving back at Rigby Road Depot, still ahead of our booked time, to finish the day. This completed 64.35km (almost exactly 40 miles!) with three different traction units and definitely reached the parts that others cannot reach. Many thanks to Gary Conn and his very friendly and helpful Rigby Road staff for their superb organisation of the event and to Drivers Dave and Chris, and Conductor Andrew for all their efforts during the day as well as our Kev Adlam. With fares and raffle revenue, the tour raised a fantastic £3,600 for the Heritage operation; some will be used to get Brush Car 634 back into service. Manchester Square looking south, bottom left is the turnout that led to Rigby Road Depot via the Foxhall Square, Princess St and Blundell St loop. Bimodes are not new, '754' (ahead) runs on the overhead or diesel. To its right is the non-wired facing crossover that we covered. Pleasure Beach, although there wouldn't have been much pleasure on the beach in this rain. A 'Moon rocket' in Hopton Road outside Rigby Road Depot. Posterior views of a BLS party (25 on the trip) pushing a 'Boat' from Hopton Rd round to Blundell St, as it is a one way street one wonders how they returned. (1 Apr 1990). 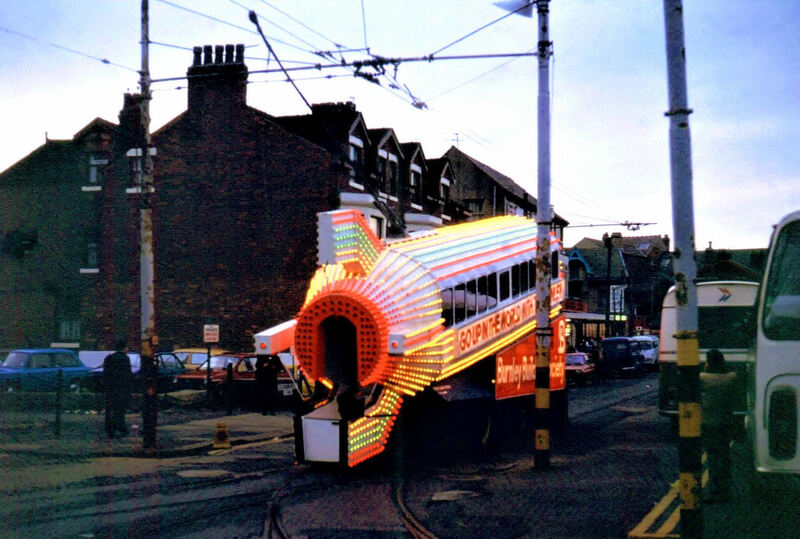 Tram '607' on the now disused and de-wired Blundell Street section, near the junction with Princess Street when the rare depot loop line was done, bringing out photographers on 28 Jun 1998.